Clever Choice ComfortEZ Insulin Pen Needles 32G 4mm 100/bx Case of 6 fits all pens, is for people of all sizes, has easy injection at all sites, and is more comfortable. Clever Choice ComfortEZ Insulin Pen Needles 32G 4mm 100/bx Case of 6 fits all pens, is for people of all sizes, has easy injection at all sites, and is more comfortable. 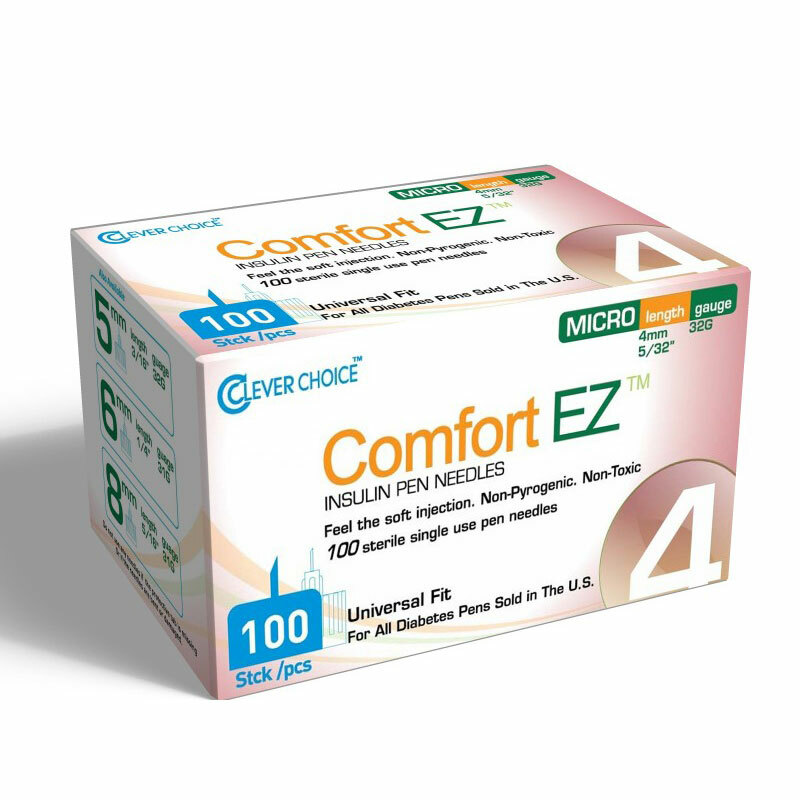 Clever Choice ComfortEZ Pen Needles are compatible with all insulin pens sold in the United States. These pen needles are a good product, I have used them for about 6 months now. I like them very much. Excellent price plus have used for years now and never a problen. These needles are great, had no problem from ordering to using them. Price is very reasonable. Have used these before and had no issues. Work well and good price. These needles are great for the price. I will use them until there is a cheaper option. However, there are problems: They leak slightly when you first screw them on, they occasionally have too much glue on the paper, and the cap never fits onto the needle snugly enough to pull the needle off - you have to hook a fingernail under the cap to avoid pulling the cap off without the needle. However, for the price, these are small gripes. If your insurance pays 100% for your needles, go with something brand name like Novofine. If you have to pick up any part of the bill, get these. Your wallet will thank you.